THE B-MOVIE NEWS VAULT: Salt City Horror Fest Returns to The Palace Theater in Syracuse, NY on April 28th! Salt City Horror Fest Returns to The Palace Theater in Syracuse, NY on April 28th! HEAD TO THE HISTORIC PALACE THEATER IN SYRACUSE FOR AN ENTIRE DAY OF 35MM FRIGHT FLICKS + SPECIAL GUESTS! 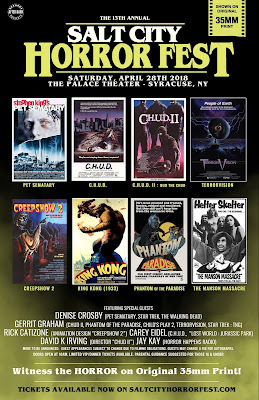 Due to various contributing factors, I sadly did not get to attend last year's Salt City Horror Fest, which featured the likes of CRITTERS, AN AMERICAN WEREWOLF IN LONDON, FROM BEYOND, THE MUTILATOR (fully uncut! ), and various other Horror classics in 35mm! And though my attendance this year may be up in the air, I really hope I can get the time off from work to enjoy eight awesome films in their native format! This year's event takes place on Saturday, April 28th! The doors open at 11:00 AM, and general admission is $35.00 (or $50 if you want a limited edition event poster), while VIP ticket holders must pay $65. While that may seem a tad expensive, it does give you the ability to enter the venue a half-hour before everyone else to save your seat, hit up the vendors, and meet & greet the special guests! You will also get a catered dinner, a limited edition souvenir event poster, and entered into a VIP raffle! Regardless of what ticket you buy, as long as your wristband is on, you can come and go all day! To secure your tickets for this awesome film fest right now, CLICK HERE! C.H.U.D. 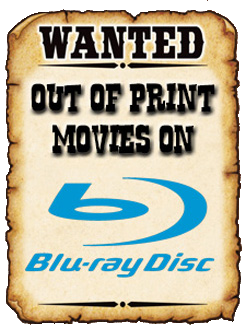 - Rare extended cut with intro and Q&A with Carey Eidel! C.H.U.D. II: BUD THE CHUD - First screening since its original release! Intro and Q&A with director David K. Irving, and star Gerrit Graham! CREEPSHOW 2 - Rare print with intro and Q&A with Rick Catizone! KING KONG (1932) - Shown in its original 1.37:1 aspect ratio! THE MANSON MURDERS - Ultra rare screening of this thought to be "lost film!" PET SEMATARY - With introduction by Denise Crosby! PHANTOM OF THE PARADISE - Intro and Q&A with Gerrit Graham! TERRORVISION - Rare print with intro and Q&A with Gerrit Graham! Mary Lambert - Director of PET SEMATARY, PET SEMATARY II, and numerous music videos! Denise Crosby - Actress in PET SEMATARY, The Walking Dead, Star Trek, et al. Rick Catizone - Animation Designer on CREEPSHOW 2. Gerrit Graham - Actor in PHANTOM OF THE PARADISE, TERRORVISION, C.H.U.D. II: BUD THE CHUD, CHILD'S PLAY 2, Star Trek, et al. David Irving - Director of C.H.U.D. II: BUD THE CHUD and NIGHT OF THE CYCLONE. Carey Eidel - Actor in C.H.U.D., LOST WORLD: JURASSIC PARK, and Daddy Dearest. Jay Kay - Host of Horror Happens Radio. Come see the world premiere trailer to his film IT'S UNDER YOUR SKIN: DON'T EAT AT DAVE'S. Salt City Horror Fest takes place in three weeks, so save the date, get a ticket, and maybe I'll see some of you Vault Dwellers there! For continued updates on this event, visit its official Facebook page! Tickets and pricing can be found HERE! Thank you Vault. You were the inspiration for Terror Vision LOL. Haha! AWESOME! You're welcome - hope to make it to the show at the end o' the month!